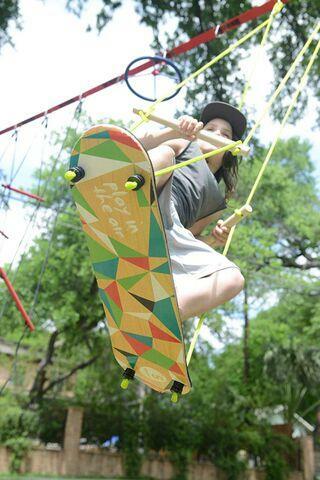 Part skateboard and part swing, this ride takes play to new heights. The wooden skateboard-like base has a prism design and a non-slip foam top; the wood hand holds are easily adjustable. Be sure to use the included reinforcement straps to protect your line. It could also be attached to a healthy tree or play structure with the included adjustable rope and 2 carabiners. Weight limit: 250 lb. Adult Supervision required.